I have hesitated to include this in My Las Vegas for awhile because I have always enjoyed calling this my secret sushi place. Sushi Twister is a sushi restaurant at the corner of Tropicana and Boulder Highway in East Las Vegas that most LOCALS have never heard of. And that is one of the many reasons it is so special to me. Sushi Twister has a fabulous atmosphere. It’s quaint and small. There is a sushi bar you can sit at or approximately 10 tables. It has a great vibe. The staff is attentive, friendly and welcoming. If you’re going to eat sushi, you need to go a little crazy. And Sushi Twister welcomes that with their all you can eat menu for lunch or dinner. Just check out this menu! I would recommend my three favorites: Salmon Loves Lemon, Oh My God! and Spiderman. Add in four order of the two-piece mussels and you have a fantastic feast. I have tried other rolls on the menu, but these are my three favorites by far. A group of co-workers and i used to go to this restaurant once a month and just destroy the menu. There is no way they made money with how much sushi and sides we consumed. I have taken a number of dates there, every one of them was amazed by my secret sushi place (although the dates themselves left something to be desired). 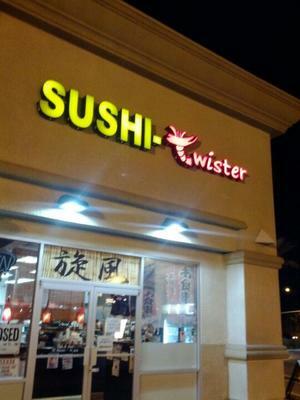 Take a fat guy’s word for it — the best sushi in Las Vegas is at Sushi Twister.